Today I would like to share with you my experience with inversion therapy. In short, inversion therapy allows you to decompress and stretch your body by reversing the effects of gravity, especially on your spine. The equipment I use is called an inverting table. It’s a robust table that allows you to go from a horizontal position to full inversion. In between, there are different positions that produce different degrees of decompressions along your muscles, spine, and vertebra. 1 Why I tried Inversion Therapy? 4 Who should not try Inversion Therapy? 8 What is an Inversion Table? 13 What is Spinal Decompression? Why I tried Inversion Therapy? I’ve been suffering from lower back pain for the last three years, and some neck pain too. The pain varied from one day to the next and could be a mild ache or really sharp and intense. I’ve been doing stretches and workouts to help the muscles relax and get stronger. This helped me a lot, and I’ll share those with you later. One day, my friend Paul told me about how an inversion table might help me with my back pain. I had some doubts, but a natural way to treat my back pain was definitely worth trying. He owned an inversion table and, because he was happy to let me use it, I decided to give it a go. My first five sessions were at my friend Paul’s house. He owns a Innova ITX9600 inversion Table (I review this model here) and he introduced to the first exercises. At first it was strange being inverted, but afterward I felt such a release in my lower back muscles. My muscles got a full stretch, and the pressure on my lower back was massively reduced, allowing the muscles to relax. And, best of all, the pain was almost totally gone. He suggested a few additional exercises which I tried slowly and gently. I went back to his house another five times. Finally, I decided to get a table for myself. I didn’t buy the same model as Paul but, instead, got another brand and model. One year ago I sold my original inversion table and bought a new one. I explain the differences, and why these three models are my favorites, in my article The Best Inversion Tables, click here to read it. Having my own inversion table at home allowed me to experiment with different exercises. With patience and time, I’ve found the exercises that best relieved my back and neck pain. I put together the exercises and created specific routines for back, neck and sciatica pain. I’ll cover these routines later this article. You can click here to scroll directly to that section. For the last six months, I’ve been doing three inversion sessions per week and each session is around 15 minutes long. I get a complete body stretch, and I try to unplug my brain from tasks, problems, and any other thoughts. I keep my focus on releasing all the tension and stiffness accumulated in my muscles. After the first month of three regular sessions per week, I felt much better. I had less pain, and my mood improved. In my experience, it’s been a very effective way to treat my back pain. If you have never tried inversion therapy, I recommend that you continue reading to understand what the benefits are, what you can expect, and how inversion therapy helps to release tension and stiffness, helping to heal back, neck, shoulder, and sciatica nerve pain. Disclaimer: I’m not a doctor, and I’m not here pretending to be one. I’m here to share my personal experience and tell you how inversion table therapy has helped to relieve my back and neck pain. Who should not try Inversion Therapy? Inversion table therapy works for me, and for many other people, but we are all different. I recommend you talk to your physician before starting inversion therapy. Long hours in the same working position, stress, and not enough sleep, can lead to muscle tension and contractions in the neck, shoulder, and back, causing back, neck and shoulder pain. Emotions like frustration, anxiety, anger, and sadness produce tension and stiffness in our muscles, which are a defense response in our bodies. Tense and contracted muscles can put pressure on nerves, leading to something called a “pinched nerve,” causing sciatica, radial, and lumbar nerve pain. Inversion table therapy provides your back with a good stretch, allowing the muscles to relax and loosen. When your body is inverted, the effect of gravity on your back, neck, and spine is also inverted. Your spine gets decompressed, and that allows your body to release accumulated tension, reducing pain. Relax Muscles – An upright fully inverted position gives your body a full, decompressing, stretch. The stretching allows your tense back muscles to relax. As your back relaxes, your level of pain is reduced and relieved. Spinal Decompression – When you hang upside down on an inversion table, you slowly start to stretch and decompress your spine. This is also known as spinal traction. Spinal traction relieves the constant pressure on your spine, and takes the pressure off compressed discs. Learn more on my article What is Spinal Decompression here. Reduce Nerve Pressure: Inverting to a 60-degree or greater angle provides a complete back stretch, decompressing the tense muscles that normally support your spine. Relaxing the tight and tense muscles around the nerves, this reduces the pressure and increases the chances of healing a pinched nerve. Naturally Realign the Spine: Hanging upside down provides your back with the kind of stretch it needs. Gravity pulls your spine in the opposite direction, reducing the pressure on each intervertebral disc. This allows the discs to rehydrate and to naturally realigns your spine. Stress and emotions play also an important role in muscle stiffness. Reduce stress, ease your emotions, and try to create more constructive and positive thinking. The first time I tried inversion therapy was at my friend Paul’s house. He has the Innova ITX9600. He helped me with some simple tips and supervised my first few exercises to be sure I was doing everything properly. The first time you try inversion therapy, I recommend that you to have somebody with you, preferably who has some experience, to make sure you don’t do anything wrong. 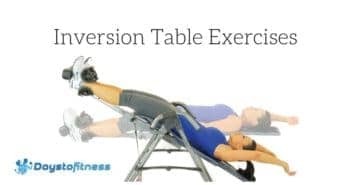 If you’re looking for a high-quality inversion table, I recommend that you check my article The Best Inversion Tables. In this article, I go through three different models and explain the differences between them, and how you can find the best one for your needs and budget. Click here. After assembly, the setup is the most important part of successful inversion therapy. Adjusting the height, the ankle locking system, adjusting responsiveness, and how to fold the table. 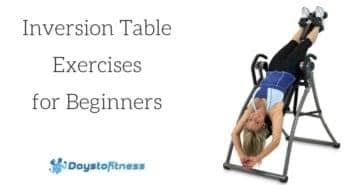 I’ve covered all this, in very simple steps, in my article How to set up your inversion table. After, I recommend you start with a simple routine so your body can get used to different levels of inversion. Click here for my beginner’s inversion table exercise routine. I’ve been doing inversion exercises for the last six months and, combined with simple stretching exercises, it’s been a very effective and natural way to heal my back and neck pain. I usually do my inversion table routine three times per week (Monday, Wednesday, and Friday). You can find it here. Sometimes, I change it for a neck routine, also available here. Early, first thing in the morning, I do a 5-minute Stretching Routine for Back Pain Relief. A video and details of each exercise are available here. Right before dinner (Tuesday and Thursday), I do a 5-minute core exercise workout. Video and details for this routine are available here. It’s a table that allows a person to invert in different angles: 30, 45, 60 and 80 degrees, or full inversion. Inversion tables are used for Inverting therapy, to provide a complete spine decompression. When you’re hanging upside down, securely and comfortably, from your ankles, your spine is stretched and decompressed. This is also known as Spine Decompression. This stretch creates a space between the discs and the vertebrae in the spine. Among other benefits, it re-hydrates the discs to reduce the pain caused by pinched nerves that can happen because of sciatica pain, for example. In the past, inversion tables were very expensive and only available in clinics or hospitals. Today, you can buy your own inversion table and do frequent sessions at home to help you reduce pain by relaxing and releasing the tension accumulated in your muscles. I’ve shared my three favorite inversion tables, along with the one I use. The reasons and my opinion are all explained here. There are different tables available on the market, and I’ve picked my three favorites and written about my experience using these models. I talk about the inversion table I currently use, and the models I have owned and used in the past. Find which model is the best for your needs and budget. Click here to discover the best inversion tables. Using all the exercises I’ve learned, I’ve created five exercise routines for specific muscles and areas to help reduce back, neck and sciatica nerve pain. I’ve also created a routine for beginners to get used to the inversion table, feeling the first stretch and benefits of inversion therapy in a simple session. 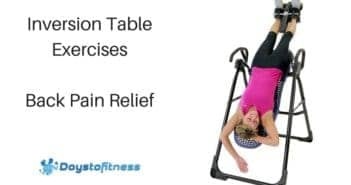 Hopefully, these routines will help motivate you to regularly use an inversion table to stretch tight muscles and release the tension and stiffness that causes back and neck pain. All the exercises have three levels of intensity: Light, Moderate and High. If it’s your first time, start with the light level. Memorize exercises, so you don’t have to keep looking at a website, book, or a sheet of paper. Save time, automate the exercises and do it in a sequence and straight way. Progress, repeating the same exercises helps to produce progression, giving you confidence and results. When I first got my inversion table, I started with these exercises to get comfortable and start feeling the benefits of these relaxing inversion sessions. Click here for Five Simple and Easy exercises for beginners. These exercises provide a complete back stretch that reduces muscle tension and stiffness. Traction and decompression reduces the pressure on the spinal discs, relieving the pain caused by any bulges. Due to my line of work, I spent long hours sat at a desk working on my computer and I developed lower back pain. Busy and stressful days quickly reflected on my lower back, causing intense pain. Besides a stretching routine (that I do early in the morning) I also use inversion table therapy for instant back pain relief and prevention. I’ve selected and created an inversion table exercise routine, specific to the back muscles. This way, I don’t have to keep learning new exercises. I just lay on my inversion table, knowing exactly what I’m going to do. In just a few minutes, my session is over, my pain is relieved, and I can continue with my day. I usually do sessions on Monday, Wednesday, and Friday. I do two sessions per day, one before lunchtime and another one before dinner. If I have to work at the weekend, I do an extra session to prevent any pain. This way, my lower back pain has almost disappeared. I say “almost” because those 14 hours days of work are very hard on my back. That’s why I have been starting to work standing up, but I will leave subject that for another article, hopefully, to publish soon. I’ve created a routine of five exercises to help stretch and decompress the muscles of the back. Click here to see the routine I use for back pain relief. Stretching your back, shoulders, and the muscles of your neck will help to relax you. Get in a comfortable position, relax your mind and emotions, and focus on the tension. Quiet your mind, letting the tension melt away. Inverting changes the effect of gravity on your body. Combined with stretching, it allows your body to eliminate all the stiffness, and unlock your muscles. I’ve selected five specific exercises to stretch the upper back muscles, shoulders, and neck. If it’s your first time, go light and slow. I have provided all the instructions, images or videos, along with relaxing tips to help you get the most from these exercises. Click here for the Five Exercise Routine for Neck Pain Relief. The sciatic nerve is the longest nerve in your body, and runs from your lower back, down your leg, and all the way to your feet. If the pressure is placed on this nerve, it causes pain to radiate through your back and down one or both your legs. This pain can range from a mild throbbing, to excruciatingly sharp, and may or may not be accompanied by muscle weakness. The cause of sciatica nerve pain is usually associated with problems with the lower back, most probably due to a bulging disc in your lower spine. If a disc bulges outward, it can put pressure on the sciatic nerve, triggering pain, weakness, numbness, or be tingling in the lower back, buttocks, and rear of the upper leg. Stretching exercises are an effective way to relax muscles, and allow your back to align naturally while easing tight and stiff muscles. Inversion table therapy helps by providing an ideal backstretch. Relaxing the muscles, it creates more space between the discs in your low spine. This relieves the pain caused by the sciatic nerve being pinched. I’ve selected some very specific exercises to help you stretch your lower back muscles and to decompress your spine. The duration of each exercise is from one to five minutes, depending on the time you have available, and your experience with inversion table therapy. Click here to find the exercises along with video/images, and instructions for each exercise. Do this routine twice a week. After, a month, increase to three times per week. Once you start doing the routine three times per week, repeat the exercises one more time later in the day. Back pain is very common, affecting a large percentage of the population. It can vary from mild, occasional, and annoying, to severe and debilitating. As a back-pain sufferer myself, I can tell you that any natural back pain treatment is always very welcome. The pain is often caused by pressure on the sciatic nerve, sometimes called sciatica. Other causes of back pain include too much sitting, poor posture, tight muscles, injuries, and weak core muscles. Inversion therapy addresses many of these problems and helps to reduce back pain by easing muscle tension, decompressing your intervertebral discs, rehydrating those discs, and improving posture. All of these factors combine to relieve back pain. To get the most out of inversion therapy, you have to relax. If your muscles are tense, they will not stretch, and you won’t experience much in the way of pain relief. However, if you feel stressed, you won’t be able to relax, and your muscles will stay tight. Stress makes your muscles contract – especially on your neck, shoulders, and back. As you get used to being inverted, you’ll gradually learn that the more relaxed your mind is, the more relaxed your muscles will be too. This teaches you to gently close your mind to stressful thoughts, and focus on how the exercise feels, your breathing, and any music you might be listening to during your inversion session. This provides a great way to escape from stress. Stress is a leading cause of illness, so anything that helps you to relax for a few minutes per day will be very beneficial – and not just for relieving back pain. When you sit or stand, blood tends to cool down in your lower extremities. If you are active, exercising or walking regularly, this is not too much of a problem, as the blood won’t linger for long. However, if you spend a lot of time sat down at a desk or driving, this blood pooling can cause circulatory problems such as varicose veins. Varicose veins are painful and unsightly and happen when the valves in the veins become damaged. This causes them to bulge outward. Inversion therapy helps restore proper circulation, keeping the blood vessels and valves healthy. Varicose veins are often removed during surgery, but using an inversion table regularly may prevent them in the first place. Because of sitting too much, and not enough physical activity in general, muscles often become short and tight. This creates tension throughout your body. Tight muscles restrict healthy blood flow, blocking out oxygenated blood, and trapping deoxygenated blood in your muscles. This can lead to pain. For example, tight shoulder and neck muscles are a leading cause of headaches. Stretching can help, but there is only so long you can hold a stretch before you get tired or bored, or run out of time. Inversion therapy stretches all your muscles passively and at the same time, which means all you need to do is elevate your feet, lower your head, and let gravity to the work. In fact, the more you relax, the better the stretch you’ll experience. Regular inversion helps reduce muscle tension, restore flexibility, and ease pain all around your body. Your body has two circulatory systems; one that circulates blood, and another, the lymphatic system, that circulates lymph. Your body uses the lymphatic system to remove and filter unwanted fluid from cells, and fight infection. Too little physical activity can make lymph circulation sluggish, as it is reliant on compression from muscles to keep it moving. However, inversion can help speed up the flow of lymph around your body, especially when you alternate between horizontal and 30-60 degrees of inversion. A properly functioning lymphatic system means fewer illnesses, and less edema, which leads to water retention and swelling, especially in the legs. Inversion therapy is very effective for reducing back pain, improving flexibility, fighting stress, and improving circulation. However, beginners often make mistakes which mean they don’t enjoy inversion therapy or fail to get all the benefits they should. If you are new to inversion therapy, avoid making these common beginner mistakes. With your new inversion table waiting to be used, you are probably tempted to use it for a long time straight away. Don’t! Inverting your beginner’s body for longer than a couple of minutes could soon lead to soreness and dizziness. Instead, start off with just a minute or two, and increase gradually from there. The steeper the angle, the better, right? Not so fast! While going past 60 degrees does increase decompression, jumping straight in at that level of intensity will probably be uncomfortable. Instead, start out at around 15-30 degrees, and then increase gradually over several sessions. Take your time to get used to being inverted so that it’s a pleasant experience and not a big shock to your body. To get the most from inversion therapy, it’s important that you do regular, short sessions, and not long, infrequent sessions. Think of inversion therapy like medicine; you don’t take all the pills in the bottle one day, and then take none the next. Instead, you take just one or two every day. The same is true for inversion therapy; lots of short but frequent sessions are better than the occasional marathon. Even if you are used to inversion therapy, it’s very important you move slowly and gradually from position to position. Moving too quickly can leave you feeling dizzy and even sick, not what you want when you are hanging upside down from your ankles! Move slowly and gradually from one incline angle to the next to avoid feeling uncomfortable, dizzy, or unwell. While you might have more free time after eating, it’s a very bad time to try inversion therapy. Instead, make sure you do your inversion exercises before you eat, and on an empty stomach. This will not only be more comfortable, it will prevent many of the instances of nausea and dizziness that beginners often report. A small glass of water before inversion is fine. If you are new to inversion therapy, you should always exercise with someone else nearby. Because you are unfamiliar with both the exercises and the equipment, it is all too easy to get stuck, feel dizzy, or feel unwell. If you are on your own, you may find it difficult to rescue yourself from inversion, leading to panic. Having someone nearby who can help if necessary means you can just relax and concentrate on your exercises without worrying about getting into difficulties. Once you are happy with inversion therapy and your inversion table, there is no reason you can’t exercise alone. Inversion offers a wide range of health benefits, including less stress, better circulation, and back pain relief. But, one of the biggest benefits of decompression therapy is spinal decompression. Your spine is an amazing structure. It’s essentially a tower of 33 bones called vertebrae, in between each is sandwiched a cartilaginous pad called an intervertebral disk. These discs act as shock absorbers between the bones of your spine and limit how far you can bend, extend, and rotate your spine. Each disc is crucial to the health and function of your spine, but they are under constant load, both from gravity and from the weight of your upper body pushing downward. This can cause your discs to become compressed. If you think of your discs are tires on a car, imagine how much thinner and less effective they’ll become if you put lots of weight into your car. That weight will squash them down to a much-reduced thickness. This means they won’t be able to work the way they should, providing less cushioning for your car. Also, compressed discs tend to become dehydrated, further reducing their functionality and health. Inversion therapy reverses the effect of gravity, so your spine and discs are decompressed. This helps restore the natural shape and thickness of the discs, relieves any bulges that might be pressing on nerves and causing pain, and also allows them to rehydrate; as the pressure comes off your discs, they draw in fluid just like a sponge. You can read more about the fascinating subject of spinal decompression in this article. When I first heard about inversion therapy, I thought it sounded like a lot of nonsense! Honestly, how could hanging upside-down help to relieve back pain? So, for many years, I ignored inversion therapy, and just smiled to myself when any of my friends mentioned they’d bought an inversion table. Then, one day, I was at my friend Paul’s house, complaining about the pain I had in my back. “You should try my inversion table” he said. At first, I was resistant to the idea, but then I figured that I’d tried almost everything else and that hadn’t worked, so what did I have to lose? Under Paul’s supervision, I carefully (and skeptically!) climbed onto the inversion table. Amazingly, and after only a couple of minutes at a very mild 30-degree angle, I started to feel my muscles relax, and much less back pain. Shocked, I headed home to do some reading and find out more about inversion therapy. It turns out that inversion therapy has been around for a very long time, and has been extensively studied. In this article, I review a few of these studies so you too can learn about the medically-proven benefits of inversion therapy. 1) How to avoid getting dizzy? Some beginners to inversion table users report feeling dizzy – either during their inversion session or immediately after. In most cases, this can be avoided by moving slowly from horizontal to inverted, gradually increasing the angle of inversion over a few sessions, and then slowly returning from inversion to horizontal. Other things to avoid include eating too soon before your inversion session, and drinking a glass of water 10-15 minutes before you start. This should stop dizziness, but, if it persists, please speak to your doctor. 2) How much space do I need to use inversion table? One of the things I love about inversion tables is that they don’t take up most space. All you need is about 2-3 yards of clear space around your table so it won’t touch anything and your head and feet are away from any objects. I set my inversion table up in my lounge, but you could equally well put one in your bedroom, spare room, garage, or anywhere you have a little bit of free space. You could even use it outdoors on warm days. Some models are collapsible and foldable, so you can put them away between sessions. This is a good feature if you have limited space, and can’t or don’t want to leave your table up when it’s not in use. I discuss foldability and portability in my article Best inversion tables. 3) Is inversion table therapy suitable for everybody? While inversion therapy is safe and effective for most people, it’s not suitable for everyone. If you have very severe back pain, are pregnant, have very high blood pressure, suffer from cardiovascular or heart disease, or have glaucoma or other eye diseases, inversion therapy may not be for you. If you are in any doubt, make sure you speak to your doctor before you start inversion therapy. You should also start with a very mild level of inversion, around 30 degrees, to introduce inversion gradually, and avoid giving your body too much of a shock too soon. 4) Why is warranty such an important feature? A long warranty provides consumers with peace of mind and helps give confidence in whatever you are buying. A company that only offers a three-month warranty is basically saying that they don’t expect their product to last very long. In contrast, a warranty of five years means they expect their product to still be working long into the future. In my article, Best Inversion Tables, I included long warranties as one of the important features to look for. To me, a long warranty means you are buying a good quality product, and while it might cost a little more, you know you are covered in case it breaks during that time. 5) How easy is it to set up an inversion table? Inversion table set up varies from model to model, and manufacturer to manufacturer. Some are very easy to set up, taking as little as 15 minutes, while others often take longer – maybe an hour or more. I’m talking about the first time you ever use your inversion table after unpacking it. Once you have put your table together, some are foldable and take just a few seconds to collapse and put away. Others cannot be folded, and you’d have to take it apart to put it away between uses. 6) What are the benefits of inversion table therapy? 7) How long do you stay on an inversion table? When it comes to inversion therapy, longer sessions are not necessarily better. In fact, most experts suggest that short but frequent sessions, and not long, irregular sessions, are best. The first time you use your inversion table, just a few minutes is all you need. As you get used to being inverted, you’ll probably feel like increasing that to up to 5-7 minutes. On average, the programs I use for back pain and sciatica relief last about 15-20 minutes, but half of that is spent either horizontal or only slightly inverted. Find my routine of inversion table exercises for beginners here. 8) Do inversion tables help with lower back pain? Lower back pain can be horrible! I should know, because of spending a long time sat at my computer working, I had back pain for many years. It was this chronic back pain that made me first try and learn more about inversion therapy, and inversion tables. The very first time I tried inversion, it instantly reduced my lower back pain. More and more people are discovering that inversion is a safe and natural way to reduce back pain. It decreases the pressure on your intervertebral discs, decompresses your spine, and relaxes tight muscles – all of which can cause back pain. So yes, to answer your question, inversion tables can help you with your back pain, as they have for mine. In fact, I have almost no back pain at all after becoming a regular user of inversion tables. My routine for back pain relief available here. 9) What does an inversion table do for you? 10) What is the best inversion table on the market? There are lots of different inversion therapy tables on the market, and making the right choice can be hard. Some are expensive and loaded with lots of features, while others are more basic and considerably cheaper. I’ve tried a few different models and, using that experience as well as researching reviews from around the internet, have written a table buying guide called Best Inversion Tables. In this guide, I discuss essential features that a good inversion table must have, what to look for when comparing models, and which tables I recommend. If you want to know which table is right for you, my buying guide will help you decide. 11) How often should you use an inversion table? While you could use an inversion table every day, I suggest you use it every other day, or three times a week e.g. Monday, Wednesday, and Friday. This means you not only exercise frequently, you also give your spine and muscles a day of rest between sessions to recover and heal. Inversion table therapy is not strenuous, but still, has a big impact on your body, and doing it every day could be too much, leaving you tired and sore. Experiment to find the ideal frequency for you. If your back is tight, try doing it a little more often, but if you feel okay, fewer sessions may work too. The one thing we all agree on is that short, frequent sessions are better than long, infrequent sessions for controlling back pain. 12) Is inversion therapy dangerous? Inversion therapy is considered to be safe for most people. That being said, if you are pregnant, have high blood pressure, suffer from glaucoma or any other eye diseases, or have serious back, knee, neck, or hip problems, it might not be for you. If in doubt, make sure you check with your doctor before trying inversion therapy. 13) What does inversion therapy do? Inversion therapy inverts your body, hanging you upside down by your ankles, to reverse the effect of gravity on your body. This unloads your spine, decompresses your intervertebral discs, stretches and relaxes your muscles, and realigns your spine. After long hours of sitting, this can help alleviate lower back pain, as well as increasing circulation and lymphatic drainage. 14) Do you have to hang fully upside down for inversion therapy to work? Hanging completely upside down can be a bit disconcerting. After all, it’s a very unnatural thing to do! Some users of inversion tables are worried about full inversion, and that makes them tense up. Being tense means inversion is not as effective as it should be. Luckily, there is no real need to completely invert yourself, unless you really want to. Studies show that an inversion of 60 degrees is enough to decompress the spine and intervertebral discs, and most people find that comfortable, and not in the least scary. I always recommend new users increase the angle of inversion gradually, taking time to get used to the different angles. This means starting at around 20-30 degrees and increasing gradually from there. Find what angle feels comfortable, and don’t feel you need to go beyond that point. Even mild inversion will do you good. So, to answer your question, no – you don’t have to hang fully upside down for inversion to work. It’s more important to be comfortable than fully inverted. Find all my exericises and routines here. 15) What does science say about inversion therapy? When I first heard about inversion therapy, I was very skeptical. How could hanging upside down help relieve my back pain?! However, after I tried it for myself and found that it really DID work, I did some reading and research, discovering that inversion therapy has been researched and studied a fair bit. In my article, What studies say about inversion therapy, I reveal five of the studies I read that confirm the benefits of inversion therapy. For example, in one study, of 175 back pain sufferers who had to take time off work, after inversion therapy, 155 of them were able to return to their jobs. It’s good to know that science and anecdotal evidence both support the use of inversion tables for back pain. 16) Do I have to use an inversion table to decompress my spine? The short answer is no, you don’t, but it’s definitely the easiest and safest way to do it. You could hang from an overhead bar, but you’d only be able to hang for a minute or so before your hands weakened and you had to let go. You would also be limited to hanging vertically, and wouldn’t be able to do many of the exercises that can help relieve back pain. Also, you could use anti-gravity boots, which have hooks on them that allow you to hang upside down from a beam or bar. This is not an easy thing to do as you’ll need to be able to lift your feet up to the bar, and you can’t graduate your angle of inversion – it’s upside down or nothing. It’s also really easy to get stuck! For these reasons, inversion tables are the safest, easiest, and most convenient way to invert your body and decompress your spine. 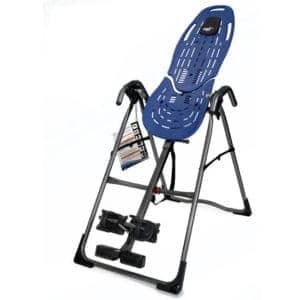 Ideal for home use, inversion tables can help relieve back pain. Find the best inversion table for your needs and budget in my article Best inversion tables. Thanks for sharing your learned experiences in this article. I’ve been suffering from low back and right hip discomfort from a motorcycle accident in mid-October. I’ve been to numerous medical appointments and felt the need to take charge in relieving my discomfort after my last appointment. Feeling the need for an inversion table to accomplish this, I did some reading and brief research and settled on a Teeter. Now that I own it I am conducting additional research on do’s and don’ts, pros and con and found your article quite rewarding with tons information. Thanks once again and ‘feet up’ ? Hi Ronnie. Thanks for your kind words. All the luck for your journey!